The "Groupe Bretagne" was formed in 1942 from the permanent detachment which was operating in Tchad, commanded by General Leclerc, against the Italian forces. It was then operating with six Lysander (close range reconnaissance), five Blenheim (Bombardment), two Potez 540 (Liaison), and three Glenn Martin Maryland (Long range reconnaissance and strafing). In 1943, the group moved to Telergma where its personnel was trained on the B-26 Marauder. In 1944, it moved to Villacidro (Sardinia) and took part in the battle of Rome, flying about 600 missions over the northern part of Italy. In October 1944, after the successful allied landing in Provence, the group moved to Istres and, shortly after, to Lyon Bron. It took part in the liberation of Alsace and flew numerous missions over France and Germany until April 25, 1945, when it flew its last mission of the war. 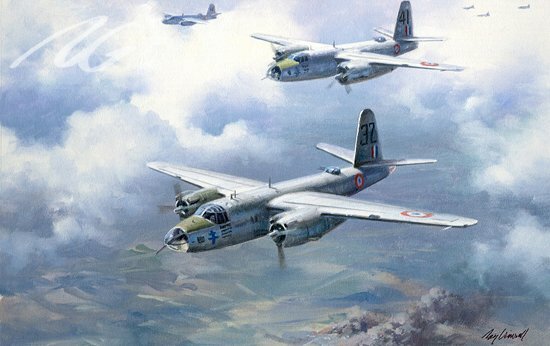 Known for its precision bombing, its team spirit, and its audacity, the Groupe Bretagne received many distinctions and had the honor to lead the allied victory flight over Paris on June 18, 1945, forming a Lorraine Cross with its airplanes. Signed in Paris, France by French B-26 pilots and crew including Pilot Henri Bourrassier, Louis-Jean Gioux, and Lucien Goubard. The original aircraft is on display at Omaha Beach Museum, Normandy, France.